Our European-style boutique hotel is a quiet refuge in Midtown Manhattan. Our 70-room boutique hotel offers personalized service and contemporary design just steps away from the Empire State Building and world-class Fifth Avenue shopping discovery is at every corner. 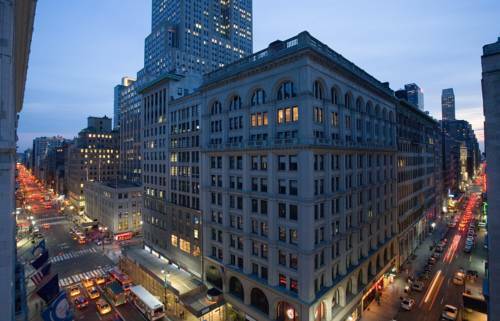 Our location is unparalleled- famous landmarks Broadway Theater and museums are all in easy reach. You will feel at ease with our friendly attentive service and be enamored with our neighborhood - filled with icons landmarks and unexpected delights. We are located on the SE corner of 35th street and 5 Avenue one block away from Empire State Building. All Reservations Require Credit Card Deposit of 100 Pct of stay due at time of booking. Yes standard 24 hours prior to arrival unless noted in the reservation. Exceptions may apply - please see rate rules. The restaurant celebrates cuisine from the Italian and French Riviera while showcasing modern interpretations of traditional regional dishes. Ai Fioris menu features inventive preparations from the land and sea as well as a selection of Chef Whites signature pastas. Bryant Park is a 9603-acre 38860 meter privately managed Public Park located in between Fifth and Sixth Avenues and between 40th and 42nd Streets in Midtown Manhattan. Although technically. The Empire State Building is a 102-story skyscraper located in Midtown Manhattan New York City on Fifth Avenue between West 33rd and 34th Streets. It has a roof height of 1250 feet 380 metre and with its antenna spire included. Macys Herald Square originally known as the R. H. Macy and Company Store is the flagship of Macy department stores located on Herald Square in Manhattan New York City. The buildings 2.2 million square feet. Madison Square Garden is an American multi-purpose indoor arena in Midtown Manhattan Located between Seventh and Eighth Avenues from 31st to 33rd Streets it is situated atop Pennsylvania Station. Times Square is a major commercial intersection and a neighborhood in Midtown Manhattan New York City. It is located at the junction of Broadway now converted into a pedestrian plaza and Seventh Avenue.